Welcome to The 4150 Fund official website where you can keep up to date with the progress being made on the restoration of our very versatile Great Western locomotive for use on the Severn Valley Railway. 4150 has strong local connections, having entered service at Stourbridge Junction shed and will undoubtedly have run on much of what is now the Severn Valley Railway regularly calling at stations such as Kidderminster and Bewdley. As well as finally coming home 4150 is also the last engine from Woodham Brother’s Barry scrapyard on the SVR yet to be fully restored, which means there is still an opportunity to be involved while history is in the making. Thank you for visiting our website and if you wish to become involved or have any questions go to our Contact page. 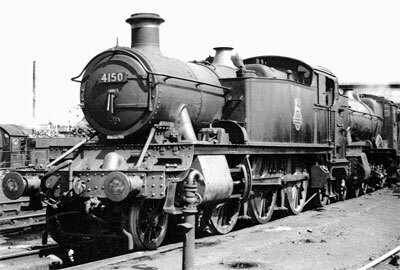 4150 at Newton Abbot shed, June 1958.